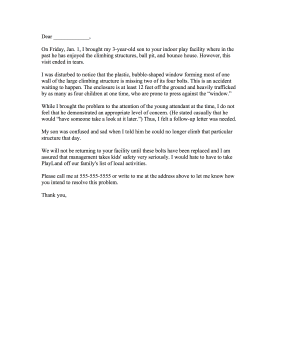 This printable complaint letter demands that a child's play structure be made safer. On Friday, Jan. 1, I brought my 3-year-old son to your indoor play facility where in the past he has enjoyed the climbing structures, ball pit, and bounce house. However, this visit ended in tears. I was disturbed to notice that the plastic, bubble-shaped window forming most of one wall of the large climbing structure is missing two of its four bolts. This is an accident waiting to happen. The enclosure is at least 12 feet off the ground and heavily trafficked by as many as four children at one time, who are prone to press against the "window." While I brought the problem to the attention of the young attendant at the time, I do not feel that he demonstrated an appropriate level of concern. (He stated casually that he would "have someone take a look at it later.") Thus, I felt a follow-up letter was needed. My son was confused and sad when I told him he could no longer climb that particular structure that day. We will not be returning to your facility until these bolts have been replaced and I am assured that management takes kids' safety very seriously. I would hate to have to take PlayLand off our family's list of local activities. Please call me at 555-555-5555 or write to me at the address above to let me know how you intend to resolve this problem.